We’ve been eyeing Steam’s metrics with no small interest since the sales this weekend. 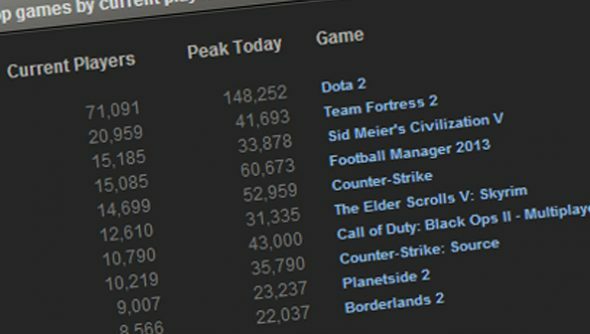 Though the games that make up the lower rungs in the Top 10 Games by Current Player Count chart come and go, one thing has remained constant – Dota 2 is far and away the most-played game on Steam, beating its closest rival TF2 by a player ratio of 3:1. At time of writing, Steam stats show that71,091 users are playing Dota 2, whereas 20,959 are playing Team Fortress. At its peak today Dota 2 saw 148,252 players simultaneously logged in; TF2 had 41,693. This despite Dota 2’s beta status. While both games are free, Dota players first have to sign-up and wait for an invite to join the game. Team Fortress 2 overtook long-time top spotter Counter-Strike to become the most-played game on Steam in June last year after it went very successfully free-to-play. Dota’s success, meanwhile, follows No Tidehunter’s frankly stunning victory at Dreamhack Winter 2012 and a rather swish International 2012 documentary from Valve. Perhaps the quintessential Steam game – and Valve’s greatest success, for that matter – is no longer what we thought it was?